Spring is here and Oak Leaf Studio is open again with new work by Ashland artist Leif Trygg. 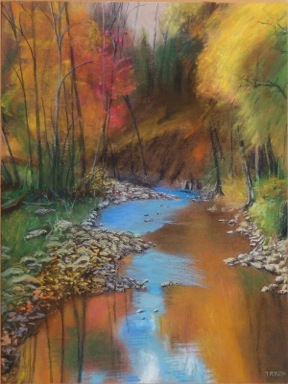 These colorful pastel paintings capture the beauty of the seasons in Southern Oregon. Prints and greeting cards of selected works are available for sale. This month at Oak Leaf Studio, selected pastels from Ashland artist Leif Trygg. This collection features the artists personal favorites from the years 2014 – 2019. Prints and cards of Leif Trygg’s artwork will also be available. 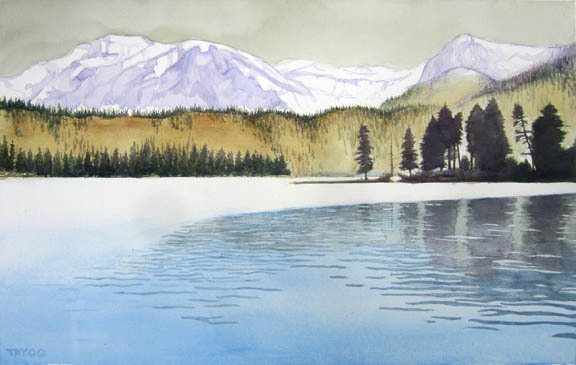 This month Oak Leaf Studio re-opens its main gallery with paintings by artist Leif Trygg. Prints and cards of the artist’s work will also be on sale. Oak Leaf Studio artist Leif Trygg is offering home portraits. An original painting is a treasured family keepsake or a thoughtful gift. Includes a dozen note cards with matching envelopes. In April, Oak Leaf Studio reopens after it’s Winter hiatus with new paintings in acrylic and pastel by artist Leif Trygg. Featured are four new paintings including Honeymoon Hotel, an acrylic influenced by Trygg’s interest in architectural landscapes. And, Late Snow on Oak Street showing an Ashland neighborhood following a late Winter snowstorm. Prints and cards of Trygg’s new art and selected previous works will also be available. Oak Leaf Studio is open from 5-8 for First Friday on April 6th. In March, Oak Leaf Studio reopens after a three month Winter hiatus and is showing new paintings in acrylic and pastel by artist Leif Trygg. In a nod to his new interest in “architectural landscapes”, Trygg will show three new paintings he completed during the winter break. The first is “Honeymoon Hotel” based on a photograph taken over 30 years ago of the Pink Palace, or Royal Hawaiian Hotel in Waikiki. Prints and cards of Trygg’s new art and selected older works will also be available. Beginning December, Oak Leaf Studio will be open on an appointment-only basis as artist Leif Trygg uses this period to create new art for the New Year. Focusing on his Home Portrait program, he will be painting several buildings and landmarks of architectural interest. Additionally, Trygg will continue to expand his portfolio of colorful pastel landscapes. His latest is titled Oregon Fall. Artist Leif Trygg expands both his medium and his viewpoint during First Friday, October 7 from 5pm to 8 pm at Oak Leaf Studio, 247 Oak Street between Hansen Howard and the Ashland Artworks. The Studio will exhibit recent acrylic paintings of evocative scenes here in Southern Oregon. For the past year Trygg has been painting exclusively in pastels, while prior efforts were composed with watercolors. “I like working with the texture of acrylics; the effects are more three-dimensional and the colors are more permanent than pastels,” says Trygg. 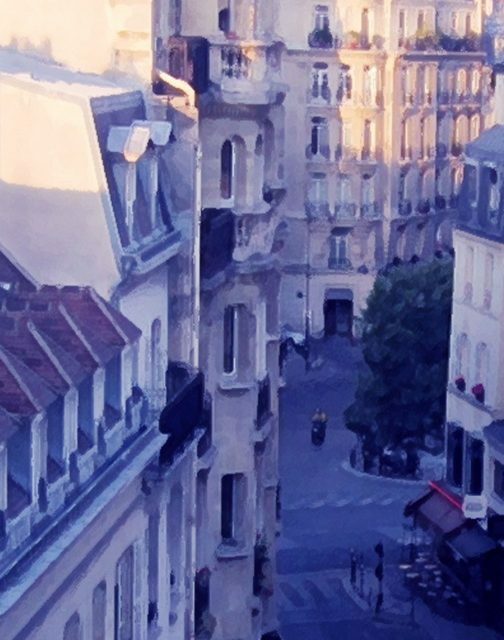 Artist Leif Trygg unveils new images from his digital photograph series Paris Blue. 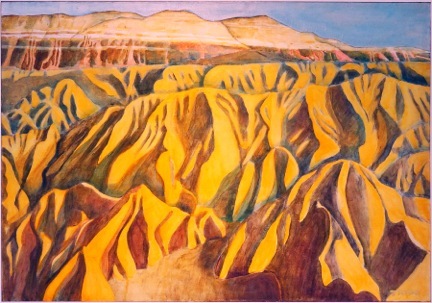 Now through July 31 at Oak Leaf Studio, 247 Oak Street between Hanson Howard and the Ashland Artworks, pastel artist Leif Trygg will show new works of art featuring majestic landscapes throughout the West. 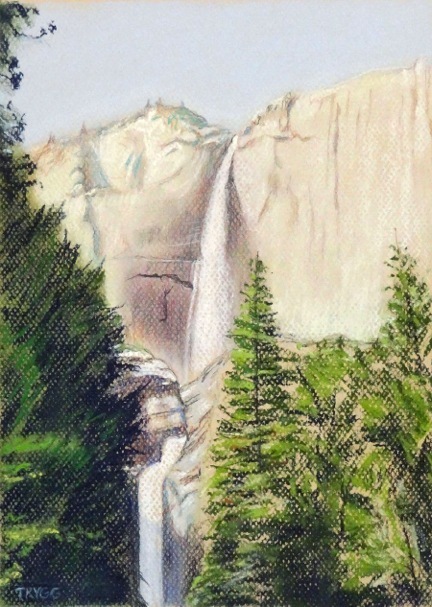 Early exposure to Yosemite as a young child ignited a life-long love of the Park and its grandeur in artist Leif Trygg. 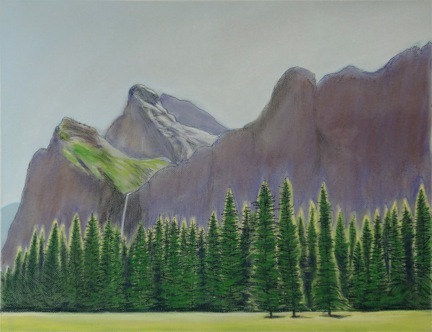 In honor of the National Park Service’s 100th anniversary, Trygg features large pastel paintings of such iconic Yosemite locations as Bridalveil Fall, Yosemite Fall and the Valley floor. Throughout his long career, the artist Leif Trygg has been attracted to the beauty of natural flowers, gardens and remote settings. This exhibit displays several of those paintings for view. Oak Leaf Studio celebrates the beginning of Spring with a show of pastel paintings highlighting buds and blooms in Ashland. Ashland High School students Ellie Dicker and Ayla Marsden will share studio space with artist Leif Trygg for the First Friday Student Show program. Oak Leaf Studio is featuring a Best of 2015 Show with hand-picked art by both fine artist Leif Trygg and contemporary artist Diana Trygg. Each has selected several pictures to represent the best work they’ve produced this season. 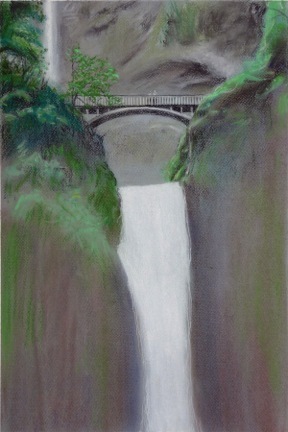 Leif’s collection includes several pastels from his Lithia Park Series as well as landscapes from around the area. Diana’s selection includes a memorial to French fashion designer Yves Saint Laurent and the Mexican artist Frida Kahlo. Prints and cards of the various images will be available for purchase during First Friday. Winter hours begin for the studio November 1 through March 1, 2016. Oak Leaf Studio will be open by appointment only during this period, aside from First Friday events. Please contact us at 541 488-5756 to arrange a time to visit. This is the “fallow” period of the studio where both artists work intensely on new pieces for the next season. Although closed for both First Friday and Saturday, October 3rd for a private event, Oak Leaf Studio will resume its hours of 11 am to 2 pm Tuesday through Saturday on Tuesday, October 6. We will also participate in the Open Studio Tour on Saturday and Sunday, October 10 and 11 from 11 am to 5 pm. Fine artist Leif Trygg will show the completed painting he featured previously of the entrance to the Japanese Garden in Lithia Park. 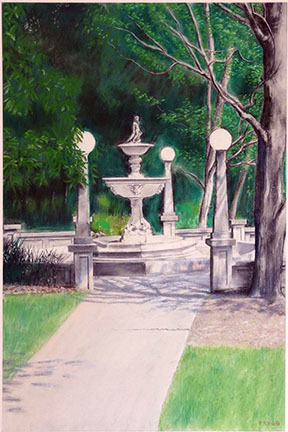 This pastel is the last of a series of images taken from the Park. Fine artist Leif Trygg will demonstrate his technique and style in creating pastel landscapes of local landmarks in Ashland during First Friday, and the entire month. 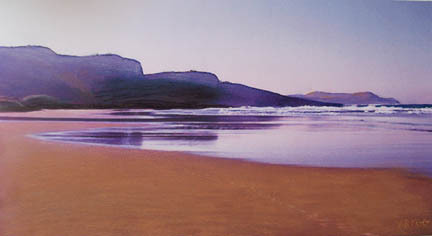 Topics covered include the process of selecting subject matter, framing the natural image to reveal the most interesting perspective of the site, the world of color selection, rendering and drawing techniques using pastels, and how and why matting and framing can make or break a picture. This picture is a work in progress that Leif will complete during the demonstrations. There are others in the queue that will follow in this on-going series of pastel portraits of Ashland. Due to a warm reception, the one-woman show by Diana Trygg has been held over through the month of July. Showing her first work in more than 40 years, Trygg creates three-dimensional collages with a wide variety of subject matter. These images are part of a new series focused on the circus. 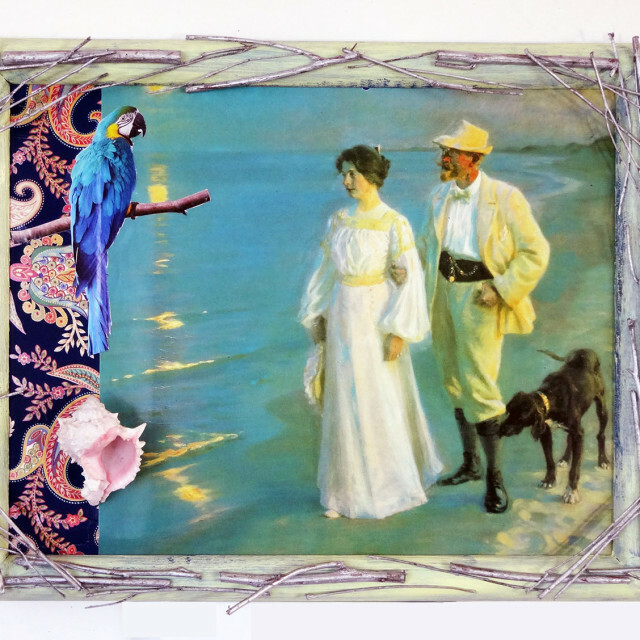 Trygg found the printed images of various performers and applied them to French drapery fabric. 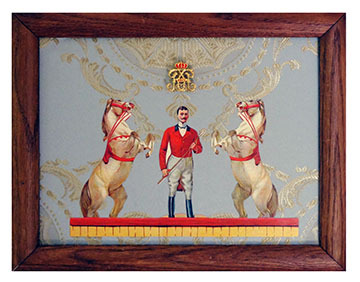 The Ring Master is crowned by a red and gold enameled brooch, while Ivan and Magda are both in frames decorated with red beads. 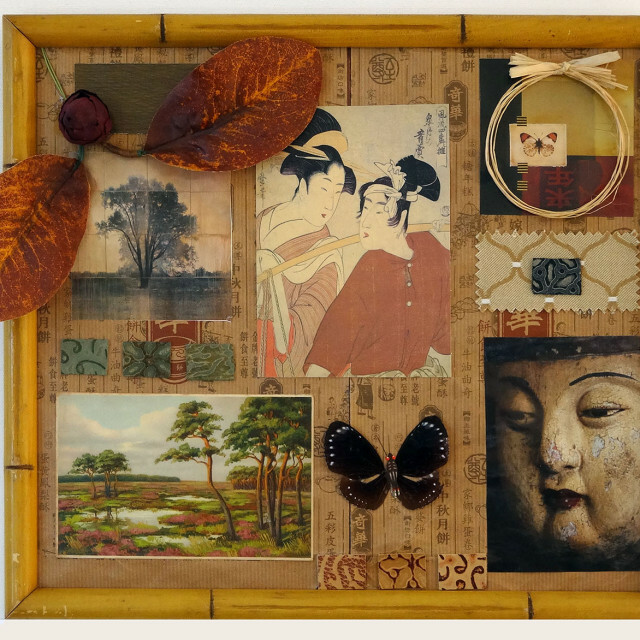 One woman show of five months worth of contemporary collages. Leif is currently working on a large pastel of Lithia Park’s Lower Duck Pond. With a myriad of different trees to paint, the picture is a study of movement and flow in numerous shades of green and blues. The completed painting is up for viewing during the month of May. “This painting challenged me in a new way because I used so many different techniques to convey the different leaf structures and light and shadow,” says Leif. Diana is working on a collage honoring Frida Kahlo for Cinco de Mayo. A large piece, the picture contains multiple images of Kahlo, three-dimensional objects recalling the jungle as well as other touches that commemorate this artist’s life. In addition, smaller pieces, such as the one shown above, are available depicting domestic scenes featuring family images for Mother’s Day, May 10. Falling water creates rivers and creeks, and nurtures colorful blooms that lift our spirits and remind us of balmy weather. Oak Leaf Studio is featuring a new painting of Lake Tahoe, which you may have seen “under construction” during the Open Studios Tour. Artist Leif Trygg has completed this mixed media piece created by using both watercolors and pastels and it is now up for viewing. Taking a cue from nature again, Trygg observes the world around him and translates those images into personal statements. His series of still-life flower paintings depict Shasta Daisies, roses, bouquets of peonies, and more. Each is a contemplative view of individual blooms rendered in compelling tones and whimsical but classic settings. Originals as well as prints and cards will be available for viewing and purchase.